Tonight was the night to sample one of Red Duck's range of older style beers again. This one, Smells Like A Pony, is a Braggot (which I will explain what is below) made with Buckwheat Honey. This is only the second Braggot I've had, coincidentally the other one was also made by Red Duck. It's fair to say that most people probably haven't heard of a Braggot, fortunately for us the boys at Red Duck have! Basically it's a beer style made by mixing mead and ale, often with a number of herbs or spices thrown in for good measure. The style dates from around the 12th century, almost a thousand years on I can't wait to see what Red Duck have done with this ancient beer style. Smells Like A Pony pours a very hazy dark brown colour, which the light really reflects off instead of penetrating it. There appears to be very little carbonation and there is only a very small head, which barely lasts a minute. As a result the head retention could be described as "awful" and there is no lacing to speak of. Still from what I understand the style is supposed to look like, this is pretty spot on. This beer smells like I imagined it would. It has the sweetness of honey combined with the strong malt character. Smells Like A Pony certainly has a strong character to it. The nose is full of strong flavours which all struggle to get a grip in the market, if that makes sense. From alcohol whiffs to honey and through a range of malt spectrum that ranges from the sweet caramel through an odd red wine smell. It's one of the more unusual noses of any beer that I can remember. Red Duck's Smells Like A Pony is a jumbled mess of mismatched colliding flavours. The malt graininess at first mixes nicely with the sweet honey, but as the beer warms up thing begin to clash. In my opinion there is too much raw alcohol on the roof of your mouth when you drink this beer and the mouthfeel just isn't right; either it's not creamy enough or it's too creamy, it's in this awkward middle ground which I don't particularly enjoy. I'm so completely lost with this beer, do I like it or do I really dislike it? Is it a stylistic problem, do I like Braggot's or are they something I really couldn't care less for? I'm going to come down on the side that I like the style but this particular one is a bit much. For me there is a little too much alcohol flavour and the drinkability isn't quite there. However compared to some of the other older styles this one is certainly more drinkable. 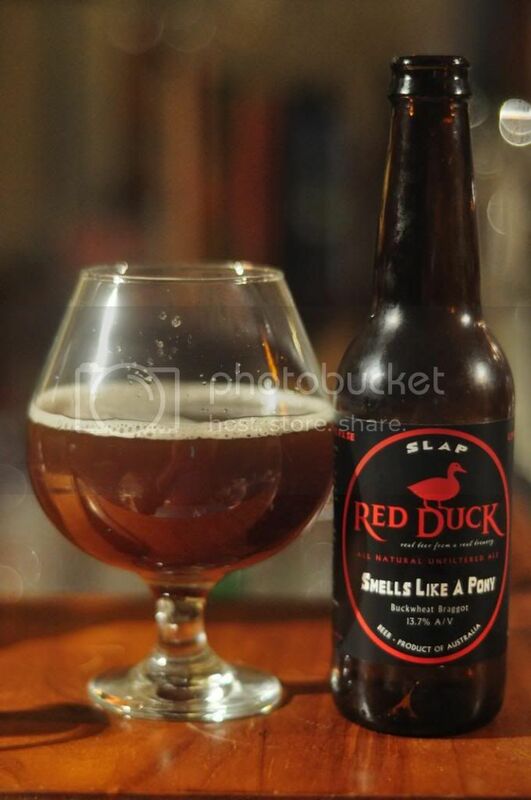 Red Duck's SLAP is a beer you will certainly have to try to know whether it's a beer you will come to love or hate.